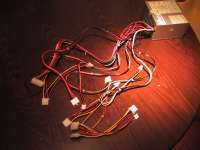 A power supply. Most people won't look at this when buying a new pc and will just buy an as cheap as possible generic PSU. 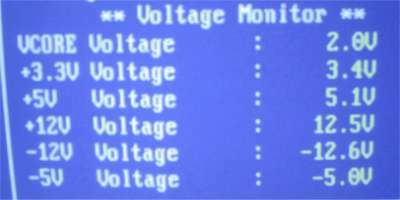 But do you know that maybe all those annoying crashes you get can be caused by your generic PSU that doesn't give the right voltages to your components? 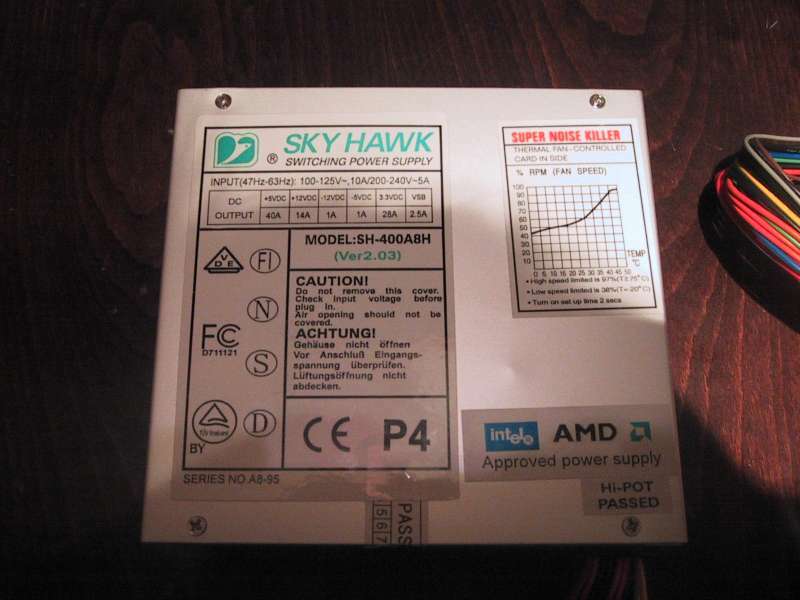 Today we'll be taking a closer look on Skyhawks (mostly known because of their cheap aluminium design cases) SH400A8H, an ATX 400W power supply with alumnium housing. Max. Power: 400 Watts-continuous/430 Watts-peak surge (1 minute maximum at 40°C). On the right side you'll see a connector for the power cable (which was also included in the package), a switch to switch the input voltage from 115V to 230V, be sure to check this first BEFORE booting up your PC because I don't think you'll hardware will like it when you've chosen the wrong one.. And under that switch you'll find a switch the turn the PSU on or out, this is also a nice feature wich you won't always find in all cheap PSU's out there. 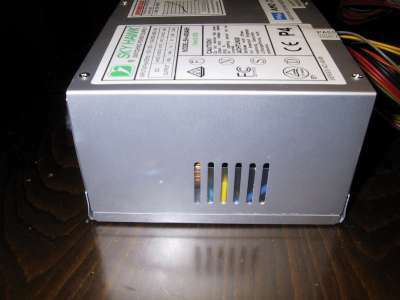 On the front and on the left side of this PSU you'll see a lot of holes to allow some more airflow to the fan. 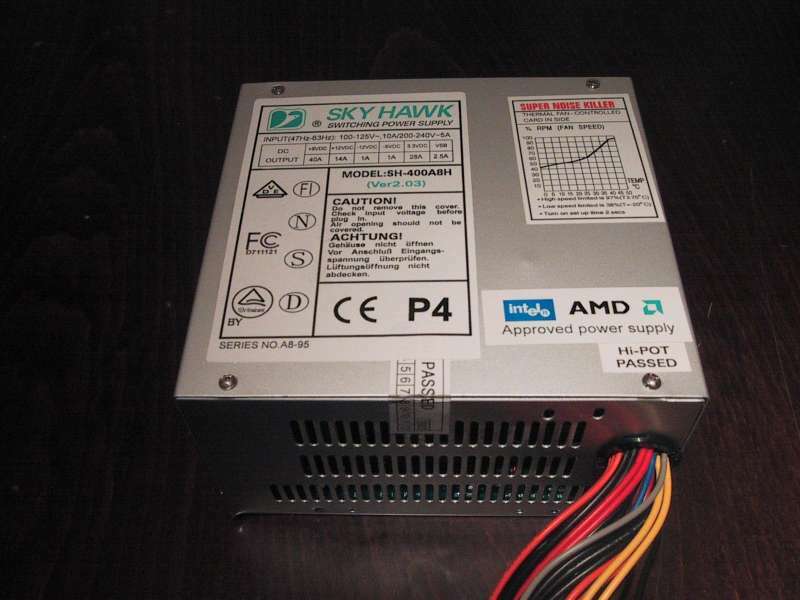 When taking a look on the top of this PSU from Skyhawk you'll see that it's both Intel and AMD approved! Also a sticker with 'Super noise killer' on it, this points out to the temperature controlled fan. Woosh look at the amount of wires! 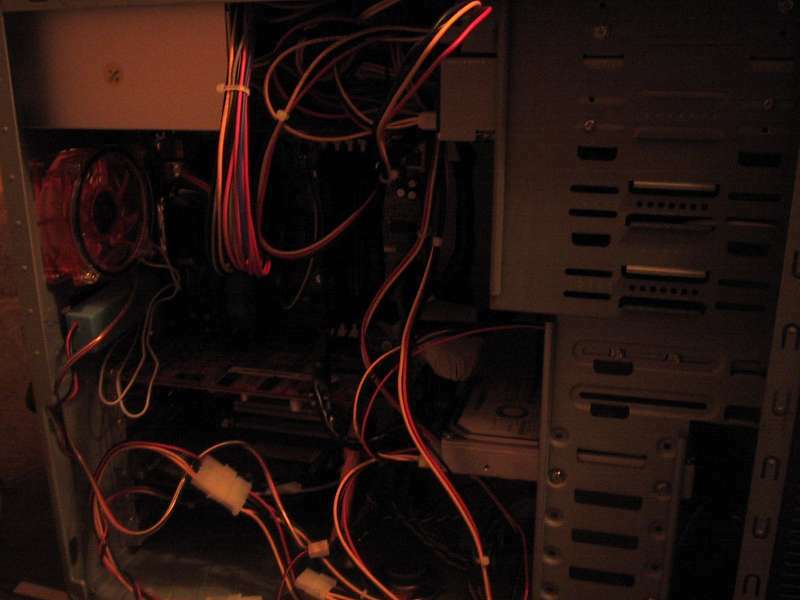 Wow just look at the amount of wires! 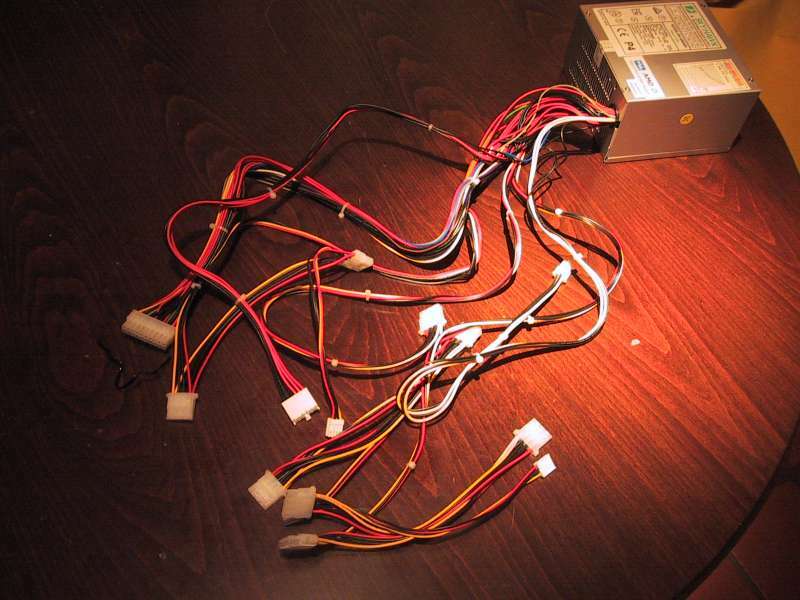 This PSU got's no less than 8 Molex connectors and 3 floppy disk connectors. 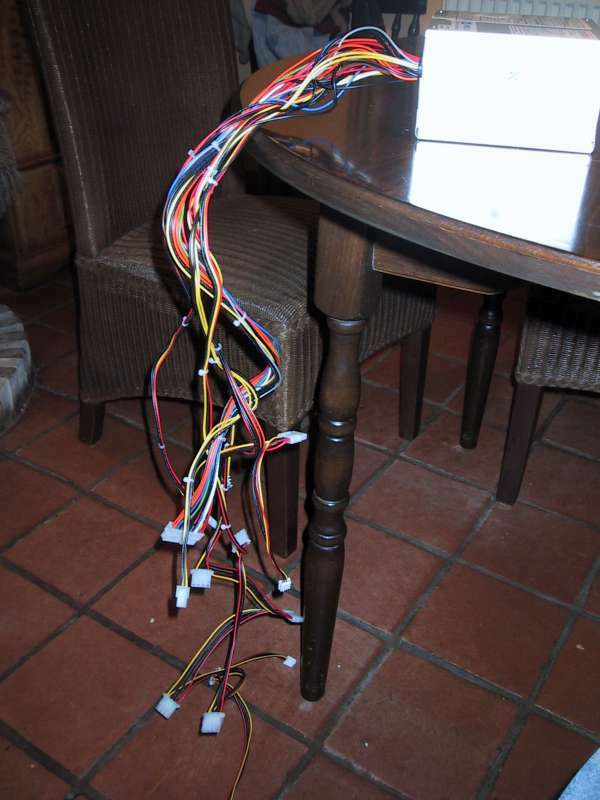 And they are also rather long, about 1 meter each so this can cause some wire mess in smaller cases. 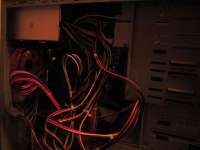 On the first pic you'll see a LOT of wire mess, on the second pic I covered most of the wires that I didn't use behind the drive bays. 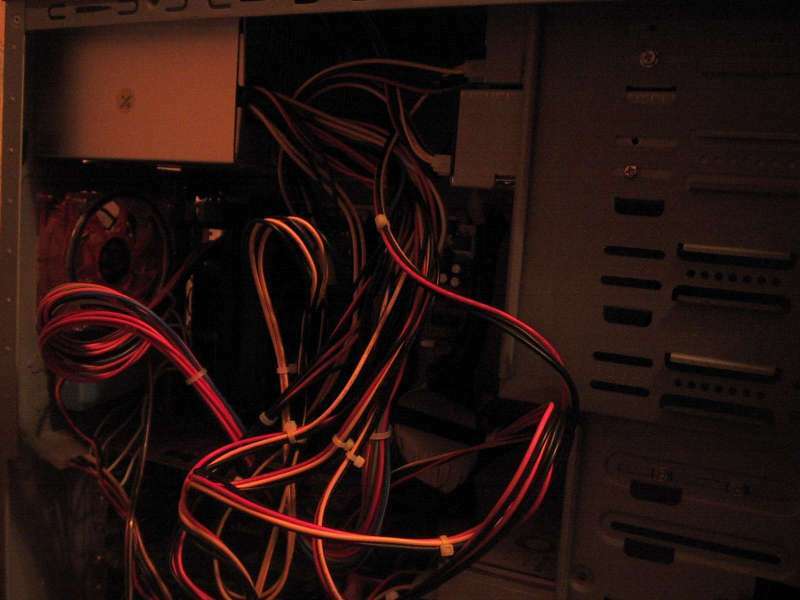 So when you hide some of the wires that you don't use than the wire mess isn't that worse. Like you can see on the pics most voltages are good, only the 12V line is on the high side. Overall this 400W PSU will be a good power supplier for most systems out there. 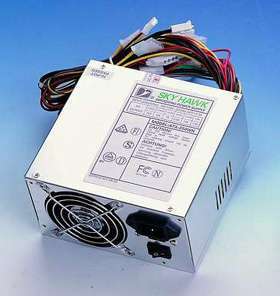 It provides 400W, has a nice aluminium housing and its fan is temperature controlled so this limits the amount of noise coming from this PSU. I couldn't notice an increased amount of crashes so I also say that it's capable of providing stable power to your PC components. Also it really has a LOT of long wires, for some people this is a big pro, but for some other this will cause a lot of wire mess in their case. Price of this PSU is $60. Do you have experience with this Skyhawk power supply? It is only $9.99! I think it is a good deal! Sorry for my bad grammar and spelling, but English isn't my main language :) I'm from Belgium and my main language is Dutch. And yes it's a good PSU, it isn't as good as an Antec TruePower or one from Enermax but hey those cost almost $40 more so it's a very good PSU when you take a look at the price/quality. Check spelling and grammar in your review. Otherwise a decent review. 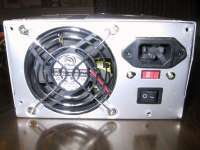 I have had personal experience with Skyhawk, Inc. and their cases/power supplies. They are a good company. Power supply is a little spendy, although it is aluminum.